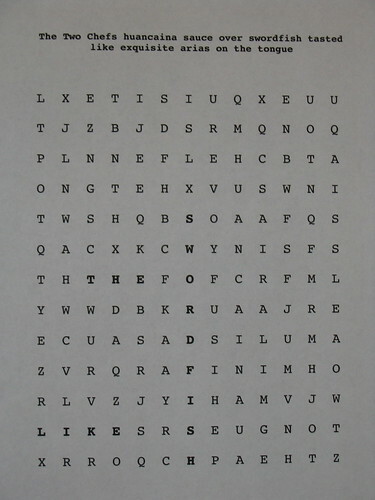 Gourmet Visual Poem, originally uploaded by carbonator. The text above is the title and the whole piece is a visual poem. Does Being a Poet Ever Get You a Free Gourmet Dinner? In Miami poetry has currency! Last night after a good day of teaching Denise and I went to my assigned local restaurant for the Now Taste This! Miami fund raising event. A local poet is paired with a gourmet restaurant and eats for free in exchange for a poem s/he will write about the culinary delights experienced that night. The poem is later printed in a broadside and auctioned off for fund raising purposes. Our dinner at TWO CHEFS was divine. The charming Chef/owner Jan Jorgensen met us at the door and led us to a nice table where the Sommelier named Franz took care of our every need. I had the Grilled swordfish with gulf shrimp in huacaina sauce served over a bed of savory hash browns. Denise enjoyed the Ribeye steak with prosciouto-wrapped asparagus and lovely onion rings. To top off the meal I savored Jan's famous Souffle Heaven Amaretto souffle. In Miami being a poet is not bad at all. Two and Two, originally uploaded by carbonator. 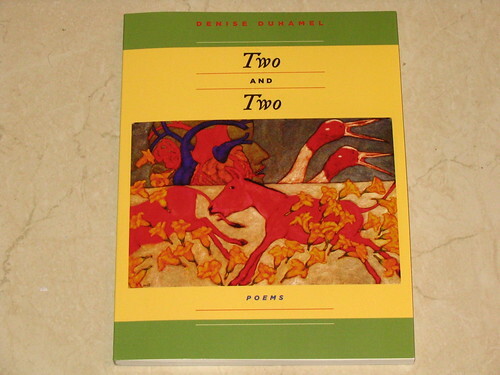 Today it finally arrived, Denise Duhamel's eighth book of poems! Cover art by famed Indian artist Amit Ambalal. Our pic and feature article in the Sunday Miami Herald, originally uploaded by carbonator. david & denise, originally uploaded by carbonator. name in lights, originally uploaded by carbonator. 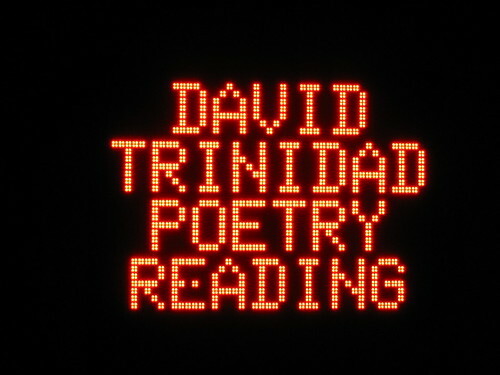 Last week was the David Trinidad fest in South Florida. We had a grand time! I'm trying something new with my grad poetry MFA students at the University of Miami in Visual and Avant-garde Poetry 504. I've made a class blog! 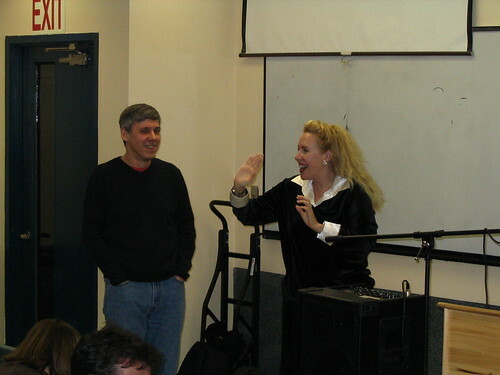 From the prior experiences of great teachers like Jean Vengua and Leny Mendoza Strobel who have used class blogs for their courses, I follow with Vispo504. If you build it will the students come, even if they are technophobes?